TUCSON, Ariz. - A high powered car at high speed was involved in a wreck that killed a woman in Tucson early Monday morning. It happened on a normally quiet street sandwiched between busier roads to the north and south. As part of KGUN9s commitment to Operation Safe Roads, Reporter Craig Smith looks at the fatal wreck and the roads around it. Tucson Police traffic investigators spent about ten hours documenting every bit of this accident scene---standard procedure when a wreck takes a life. It was about 2:30 in the morning when Federico Bravo heard what sounded like a tire blowing out. 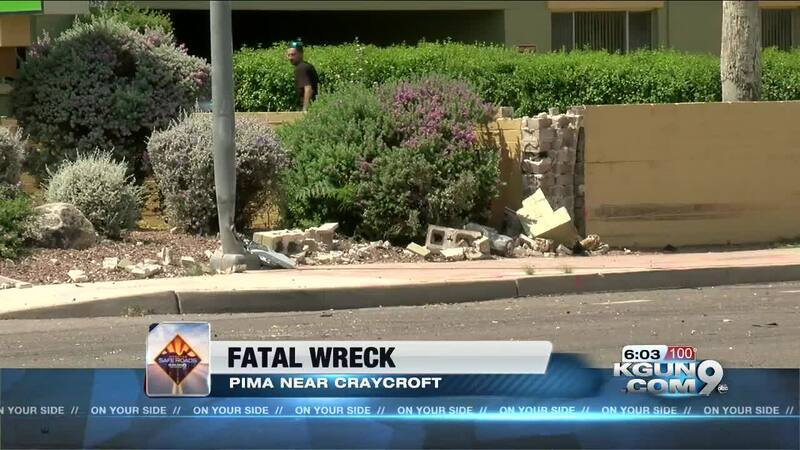 The car was on Pima, headed eastbound from Craycroft. Right near a senior living facility, it clipped a wall, clipped a light pole, clipped a curb. The car begins to roll and tumble. It has enough speed and momentum to make it about the length of a block before it finally stops. The force of the wreck threw the male driver and female passenger out of the car. Police suspect, but are not prepared to confirm yet that they were not wearing seatbelts. The woman, who has been identified as 34-year-old Alexandra Belbey, died at the scene. Emergency workers moved the man to Banner UMC hospital. The broad, straight Pima Street seems like an invitation to speed. Police say they don't see an unusual number of traffic safety calls for Pima Street. KGUN9 used TPD's statistics site to check Pima between Alvernon and Wilmot. In the most recent six months TPD logged 12 traffic related calls on Pima compared to 38 for the same West to East stretch of Grant and 59 for the similar stretch of Speedway. But neighbors along Pima say they do see what seems like dangerous street racing, more by motorcycles than by cars.